It’s been a whole week since we’ve heard any new rumors on the expected iPad 3 launch. But now the rumors are back in the news and stronger than ever. 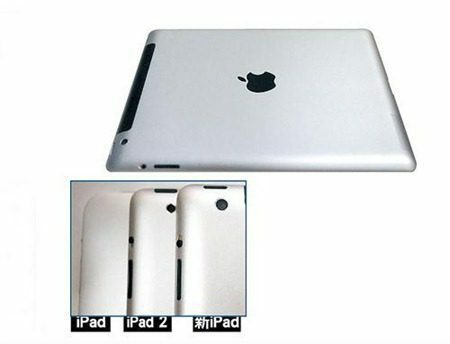 A Chinese website, Apple Daily, has leaked what they say are photos, and details, of the next generation iPad. The photos are being widely circulated on the internet and are posted below. They don’t show much, just the backside of the alleged iPad 3. It looks a lot like the iPad 2. The photo includes a close up comparison of the corners between the original iPad, the iPad 2 and the iPad 3. From the image, it appears that the camera lens is different and perhaps the edges of the tablet are more tapered. Specs wise, Apple Daily said the new tablet will have an 8 megapixel camera. It will have the same screen resolution as the iPhone 4S, 2048×1536, which Apple is calling Retina Display. There will be a quad core processor in the tablet, and it be loaded with the new IOS 5.1. They agree with another rumor we told you about here, that Apple will reveal the new tablet to the world on March 7. Apple Daily also said they were unsure whether the new iPad would be called an iPad 3 or an iPad 2S.